​Schedule will be posted online after 4 p.m. MT on Oct. 28, 2019. 2018 Format is listed below, we will update this for 2019. This camp is open to all participants; limited by age and number of athletes the camp can take. Individual Showcase price includes T-shirt (you will be given the size indicated on registration), a minimum of 2 instructional showcase games, parent talk, skills clinic, and open house. Player check-in will start on Thursday (Nov. 1st 2018) at the Ramada On The Beach in the Neptune room, Upon checking in you will receive your bib with your personalized number. Make sure you wear your bib during the entire event . All players MUST check in or have another parent pick up their packet THURSDAY NIGHT. Please bring everything you need to play Friday morning to Princess Anne Athletic Complex including your bib! At the end of the event you will exchange your bib for your participant T-Shirt the size indicated on your entry/registration form will be the size you receive. Each player must provide their own bat bag, glove, bats, helmet, uniform, sweats, catching gear, etc. Bring your own water and food! All refunds requested prior to Oct. 5, 2018 will be granted a full refund minus the administrative fee (20%). No refunds will be issued after Oct. 5, 2018. ​Please plan all travel after 4 p.m. on Sunday November 4 2018. Thursday, November 1: Check In at the Ramada On The Beach in the Neptune room from 6:00 PM to 8:00 PM. Packets MUST be picked up Thursday night. If you cannot make it yourself please arrange for another parent or player also attending to pick up the packet. Friday, November 2: Skills Session, Princess Anne Athletic Complex. Pitcher and Catchers check-in at 7:30am ready to start at 8:00am all other positions check-in at 8:00am ready to start at 8:30am. ALL PLAYERS AND PARENTS, at 11:00am a parent/player talk will take place. A Triple Crown representative will provide information on finding the right college fit for the student athlete. Everyone is welcome and we strongly encourage everyone's attendance. 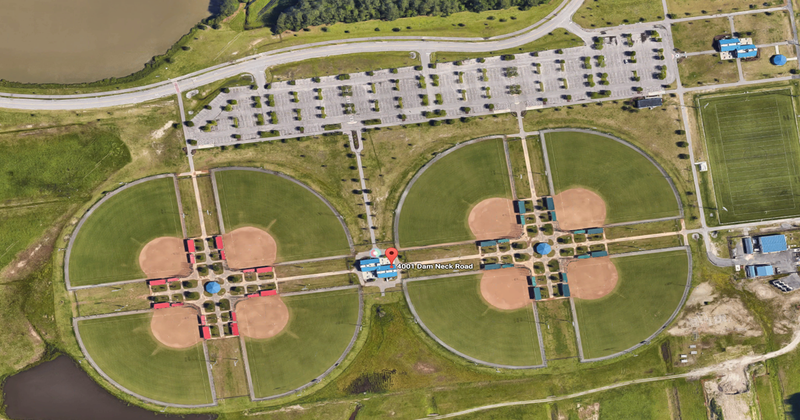 Saturday, November 3: Showcase Camp Games, Princess Anne Athletic Complex (Scheduled Field). All players must be with their team at the scheduled field (teams and schedules will be posted one week prior to the event) and copies will be in the player packet received at check in. Cleats on and ready to warm up by 7:30 AM. Sunday, November 4: Open House with the College Coachers 9:00am Princess Anne Sports Complex (Scheduled Field). Open House with the College Coaches. Remember, some coaches are not allowed talk to all players (NCAA) so do not be offended if they cannot. ​All individual showcase games are 6 innings. 6/7 batter half innings - after 6 or 7 batters the offense and defense will switch (6/7 batter half innings are used if there are 13 players on the roster which is the max). College Coaches will be calling all balls, strikes, and outs during the individual games as well as be on the field to instruct and develop fundamental skill of the participants.